Few DJs can match the knowledge, talent and versatility of Edwin Ruano, aka DJ E-Wrek. He as over 20 years experience as a DJ in some of the hottest venues across the Central Coast. As a full time radio programmer and DJ for multiple online radio stations, E-Wrek is a virtual encyclopedia of hit music, making him a versatile MC and DJ/VJ for any event. He has moved crowds and orchestrated unforgettable party nights in hot spots across the country, including local nightclubs such as Madison's and Sandbar. Other club appearances include Azul and Blitz Ultra Lounges (Alhambra), Maverick's, 510 Events Center and Rancho night Club (Santa Ynez), Ruby's (Oxnard), Club Haze and Pangea (Austin), Insert Coins and Planet Hollywood (Las vegas), as well as performances for thousands of concert fans at the Earl Warren Show Grounds, He has MC'ed Santa Maria Fair Park, Pozo Saloon and other well-known venues around the region. As programmer for KPAT 95.7 The Beat and KBOX 104.1 Pirate Radio, his experience also includes working with such world-renowned artists as Pitbull, Baby Bash, Far East Movement, Justin Bieber, and countless others. You can catch him weekday mornings as host on 95.7 The Beat's "Central Coast Morning Wake-Up", in addition to his mix shows featured every weekday on The Beat and other stations around the country. E-Wrek's experience and skills are guaranteed to make sure any event is a great success. His versatility allows him to tailor the event to any audience. With a music collection containing thousands of song titles in every genre in the musical spectrum, E-Wrek is a well rounded DJ the that can mix, scratch with out skipping a beat. 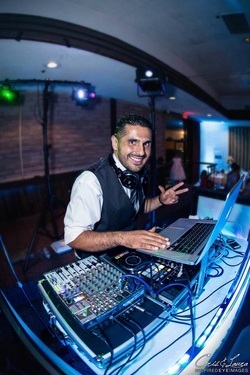 DJ E-Wrek is a multi-dimensional talent who understands that your event is the star, and he is there to help make sure that star shines and gives you the unforgettable memories you want and deserve.